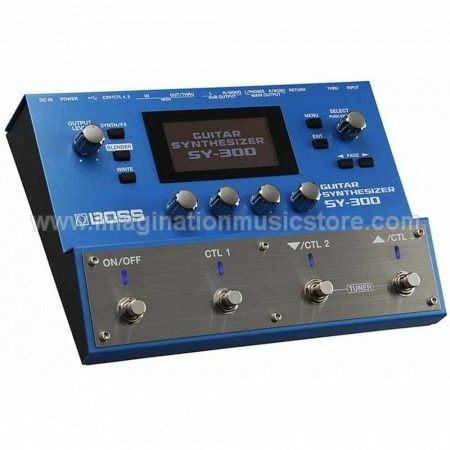 Take your guitar into the world of sound creation with the SY-300 Guitar Synthesizer from BOSS. No special pickup required. Just plug your guitars right into the 1/4-inch jack and play! Brand new BOSS technology gets you fat, analog-style polyphonic synth sounds with zero latency, seamlessly extending the natural expressiveness and familiar feel of your favorite guitar. You can also shape your actual guitar tone with the onboard filters, amps, and LFOs. From soundscapes, to leads, to textural pads, and everything in between, the SY-300 lets you create sounds never heard before. The BOSS SY-300's powerful polyphonic synth engine brings a limitless range of new sounds to your arsenal. Just like with the classic analog synths of the world, you have complete creative freedom to invent sounds with a full palette of synthesis parameters. Select different wave shapes, tweak them with filter, amp, and pitch controls. Or modulate them with LFOs, and layer oscillators for rich, complex tones. Dig into the Blender function to mix and match settings from different synth patches to open whole new possibilities of sounds. Tapping into BOSS's legendary guitar synth technology has never been easier. Most guitar based synth products require a special pickup, cable, or even guitar design to access different sounds. But the SY-300 can be used with any guitar's standard 1/4" cable. And ultra-fast DSP, along with newly developed innovations from the BOSS engineering team lets the SY-300 perform absolutely latency free! Now you can get new palette of sounds, that are a natural extension of your guitar playing. You are free to connect with your guitar just as you always have. 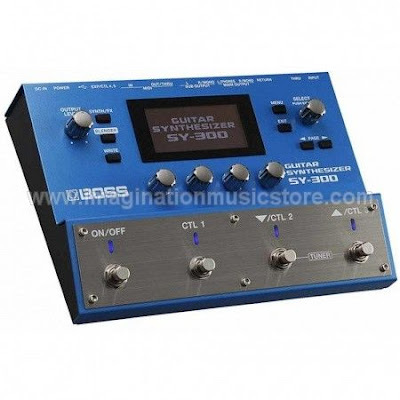 Beyond its amazing synth voices, the SY-300's synth engine can be used to process your normal guitar sound as well. Apply filtering to alter the basic tonality, use amp parameters to alter your attack and decay. Even add some movement with the LFO and step sequencer to create complex rhythmic tonalities. With these powerful controls you're able to extend your regular axe with an endless supply of unique creative textures. Dig in and give any of your guitars a whole new sonic personality. The best of analog-synth sounds in the BOSS SY-300.